This is my favorite pasta salad. I like to make a whole meal of it by adding grilled chicken. (Somehow the chicken never made it into the photos.) It also holds up well in a packed lunch. You’ll be the envy of others eating a fast food meal or lunch meat sandwich as you feast on this. This is one dish that turns out a bit different every time I make it, because I use what I have available or what sounds good at the moment. As always, feel free to substitute ingredients to your own tastes and pantry items. 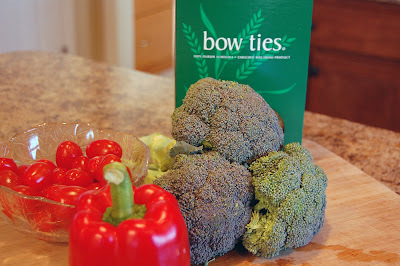 bowtie pasta – This was only a 12 oz box. I prefer 16 oz box, just because I end up with more. Cook the pasta according to the package directions. Chop the veggies. 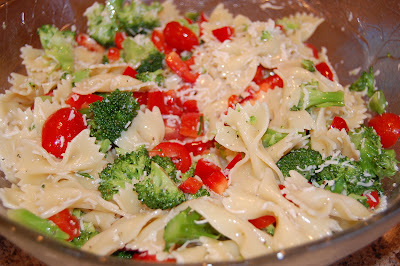 Add the chopped broccoli to the pasta water about 2 minutes before the pasta finishes cooking. This is enough time to make the brocoli a bit more tender, but still crisp. Drain the pasta and broccoli and run it under cool water to stop the cooking process. Put it in a big bowl with the other veggies. This dressing recipe comes from the New Recipes from Mooswood Restaurant cookbook. Just whisk all the ingredients together, or put them in a container with a tight fitting lid and give it a good shake. I really like using fresh basil in this, but I didn’t want to pay for it in the grocery. Stir the dressing into the salad. I added some mozzerella cheese to this that didn’t make it into the ingredients photo. I also like adding shredded parmesan and after cooking with gorgonzola the other day, I think that would taste great in this pasta salad too. For the grilled chicken, just season it with salt and pepper and grill. Slice or chop it into the salad. This looks scrumptious! I love me a colorful pasta salad! This is GREAT! You could even mix it up a bit and go Greek with Feta replacing the parm and adding in some cucumbers and olives (I heart calamatas but they are pricy). 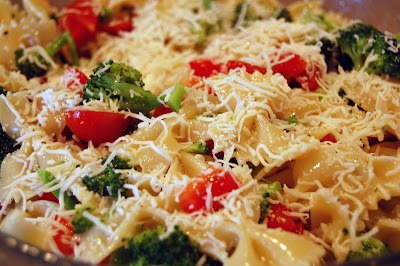 Very pretty I love pasta salad. I cant wait to try this recipe. Looks yummy…and super easy to boot! Thanks for sharing. Now for that devilish looking pudding cake that I just saw….holy buckets! I’m going to print this out and try it. It looks really good! This is a perfect warm weather salad! I’m bookmarking this for MEmorial Day! The color are so vibrant! DiPaola Momma – Greek style sounds really great! I will have to try that! I am going to try this one this week. That looks delicious! The dressing sounds fabulous as well. I will have ot try this one! hey thanks for stopping by my blog. I am so sorry to hear about you loss. Yum! This one looks good. I will have to try it. My little boy loves pasta! Yum-this looks delicious! I am so excited for salad weather. I love pasta! I can’t wait to try this. 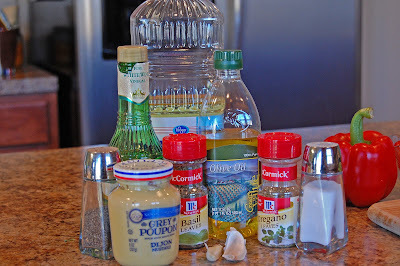 I made this recipe today substituting Balsalmic vinegar for the red wine. I omitted the vegetable oil and used only 1/2 cup extra-virgin olive oil instead. I grated parmesan cheese on top. It was heavenly! Got great reviews from my husband too, so I’ll definitely be making this one again. Thank you for sharing. I have been searching for a pasta salad that had a “decent dressing” and this was absolutely superb. My older son asked was this another one of Mrs. King’s recipes and I told him yes. This is the perfect pasta salad recipe. I have never been fond of buying already made pasta salad at the deli; the frugal side of me kicks in every time. Now I will no longer be tempted, I can make it at home and it is yummy! Thank you for this one. We made this… it is delish! Will def be a summer favorite.